Track N’ Go Treads Turn GMC Sierra Into The Perfect Winter Vehicle. At least half of us out there have found ourselves in a snowy environment, gazing upon a pickup truck and wondering what it would be like if it was equipped with a set of treads instead of frilly, impractical wheels. Thanks to the Track N’ Go, our wishes can come true. 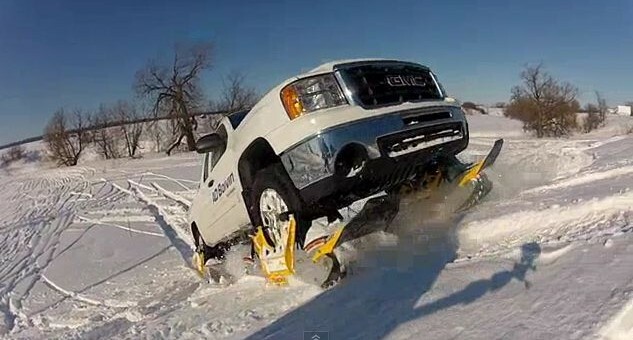 As demonstrated in the video, the Track N’ Go by AD Boivin fits like a set of snowshoes for your 4×4 pickup truck, and allows the GMC Sierra test vehicle in the video ford through snow nearly waist high. And in the spirit of innovation, the company says that this is the world’s first wheel-driven track system. Good thing we found this video just in time for the next winter, at which point we hope the Track N’ Go will come to market. those are so friggin epic. i want a set. oh and those would come in handy for a farmer who has to check his cattle when the snow is up to his waist. or to go out to load a broken down snowmobile.